We're going to guess many poor decisions were made that night. It’s a trap that most of us have fallen into: making a rash or regrettable decision after a few cold Coors Lights. Blame it on the booze, right? A new study out of the University of Missouri College of Arts and Sciences sheds light on how the brain processes mistakes in the presence of alcohol. In a finding that runs contrary to previous thinking, it turns out we still know we are making mistakes when intoxicated. We just don’t care as much. “I suppose the main implication is that people shouldn’t assume ‘I was drunk’ is a good excuse for doing things one knows he or she shouldn’t be doing,” wrote the study’s author, Dr. Bruce Bartholow of the University of Missouri, in an e-mail. The study will be published in the Journal of Abnormal Psychology. “It’s not as though people do drunken things because they’re not aware of their behavior, but rather they seem to be less bothered by the implications or consequences of their behavior than they normally would be,” Bartholow added. Bartholow set out to bring clarity to an area of ambiguity in brain research: Does the strength of the ERN – the error-related negativity “alarm signal” set off in the brain by mistakes – change with the presence of alcohol? Research out of the Netherlands in 2002 had concluded that intoxication reduced the brain’s capacity to detect errors. However, Bartholow’s study challenged that assumption by asking if it’s possible that the ability to detect errors actually remained the same – but alcohol changed the brain’s reaction to those errors. “I wondered whether alcohol's effects on error processing were less about reducing awareness of errors and more about reducing the distress that normally accompanies errors,” Bartholow said. In the study, a group of 67 people aged 21-35 were split into three groups. While two of the three groups received a placebo alcohol (10-proof vodka-tonics), or just plain tonic, the third (lucky?) group received alcoholic beverages -- 100-proof vodka-tonics. The participants in the alcohol group got to a blood-alcohol level of about .09 percent -- just over the legal driving limit. 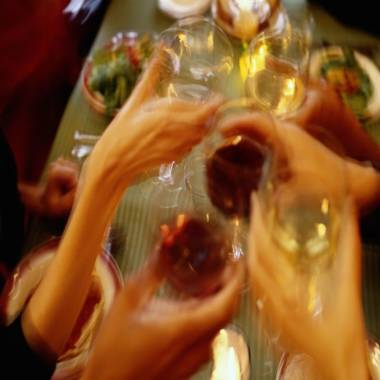 The other two groups remained at a .00 percent blood-alcohol level throughout the study. All participants were then tasked with completing a challenging computer task. Bartholow’s team noted that while all the groups made mistakes, those which had consumed alcohol were less likely to notice their errors. The alcohol drinkers were also less likely to slow down after an error. However, in addition to monitoring their performance on the computer, participants also measured the subjects’ mood. Perhaps unsurprisingly, the alcohol group reported feeling less negative. (Hilariously, the group which received the placebo had a more negative mood.) Using these measurements, Bartholow’s team was able to demonstrate a correlation between the mood of the participants and the strength of the ERN. A less negative mood equaled a less severe ERN. For the study author, the findings represent an important step in understanding how alcohol affects the brain – and the mistakes made by people who have had a couple brew-dogs. Further avenues of research could include testing whether drunk people can be sufficiently motivated to care about their mistakes (and if so, would their brain responses be similar to those of sober individuals). Another possible avenue Bartholow is pursuing is testing whether the error-related brain activity differences observed in the study will produce changes in other parts of the brain as people attempt to correct their mistakes. In what promises to be endless entertainment for the research assistants, Bartholow is pursuing the use of an fMRI (functional Magnetic Resonance Imaging – or scans that measure brain activity) machine to take measurements of the study participants. Why do hangovers seem so much worse as we get older? I'll never drink again! Never mind. Cheers!